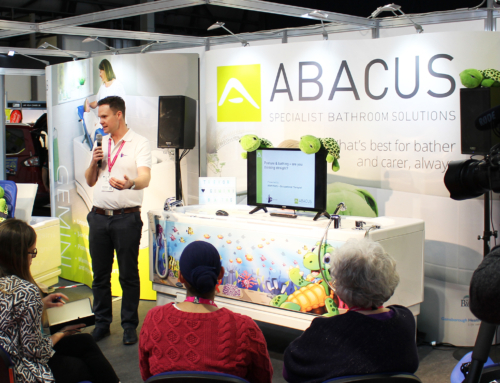 Abacus Healthcare has successfully showcased its accessible Gemini, Scorpio and Aries baths on a new look stand at The OT Show (Stand H50, NEC, 22-23 November 2017, NEC, Birmingham). Abacus Healthcare is a trusted manufacturer and supplier of power-assisted baths for disabled bathers. Through a choice of variable height and transfer seat features, Abacus baths provide a safer and more pleasant bathing experience for bathers. Carers can operate at safe working heights and with a reduced need for manual handling – lowering the risk of back and musculoskeletal injury. 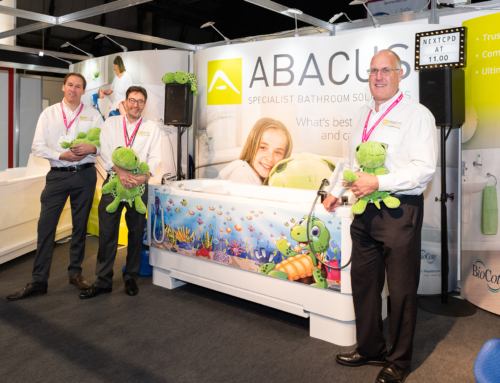 At the 2017 OT Show, Abacus offered live demonstrations of three models from its popular range which generated healthy interest from Occupational Therapists seeking proven accessible bathing solutions. On display at The OT Show, the Gemini is the only assisted bath with a double lift action and integrated changing, drying and bathing platform. As a leading choice for pediatric OTs, the Gemini is a reliable and ergonomic bath that reduces the number of bather transfer processes. Its dimensions reflect that of a standard bath so fitting is straightforward and its design is suitable for all the family irrespective of ability. The Scorpio is available as either a fixed or variable height bath with a powered or manual bather transfer seat. The transfer seat is ideal for semi-ambulant bathers who need greater assistance getting in and out of the bath. Once lifted, rotated and lowered in the water, users can enjoy a supported bathing experience and closer engagement with carers. The 1700mm and 1800mm Aries offers a hoist-friendly bathing solution ideal for bathers with more challenging disabilities. The company cuddly toy Mascot ‘Trevor the Turtle’ was dressed as a ‘superhero’ to reflect the OT Show concept this year and could be won as part of a free prize draw.